During this workshop we will examine 'Icons' (an Icon is traditionally a religious work of art for concentrating devotion and prayer. The artwork usually takes the form of a painted figure or face set against a gold background, the gold representing heaven or the deity). This workshop will concentrate on transforming the ordinary into the extraordinary and timeless. This is a genre which has interested me for some time and I have recently embarked on my own series of modern day icon paintings. 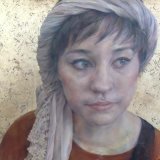 I now want to share this with you in a 2 day workshop where you will learn how to improve your drawing skills as well as learning new techniques of gilding (applying gold leaf) - day 1. On the 2nd day you will apply oil paint to your gold leaf panel and learn about colour mixing/application in relation to the human face. 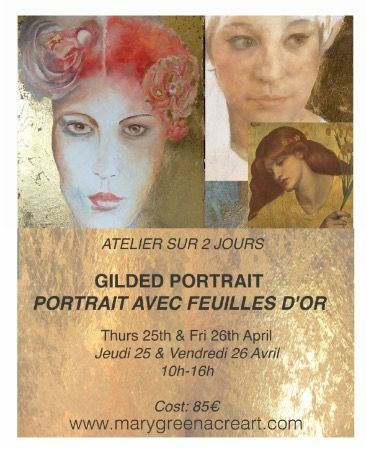 By the end of the 2 days you will have completed your own modern day icon (a portrait using oil paint and gold leaf). I will demonstrate at appropriate stages throughout the 2 day workshop, and will be available with advice and suggestions. This workshop is mainly aimed at participants with some experience of drawing/painting (though it is not necessary to have used oil paint previously). Pendant cet atelier, nous étudierons des Icônes (traditionnellement religieuses, pour emmener à la devotion et à la prière. Cet art prend souvent la forme de visages peints sur un fond doré représentant le paradis et le religieux). Durant cet atelier, vous apprendrez comment améliorer vos techniques de dessin, ainsi que la technique d'application de la feuille d'or. À la fin des deux jours, vous aurez réalisé votre propre icône moderne (un portrait à l'huile et à la feuille d'or). Cet atelier est destiné à des étudiants confirmés en dessin et en peinture (il n'est pas nécessaire de connaitre la technique de peinture à l'huile).